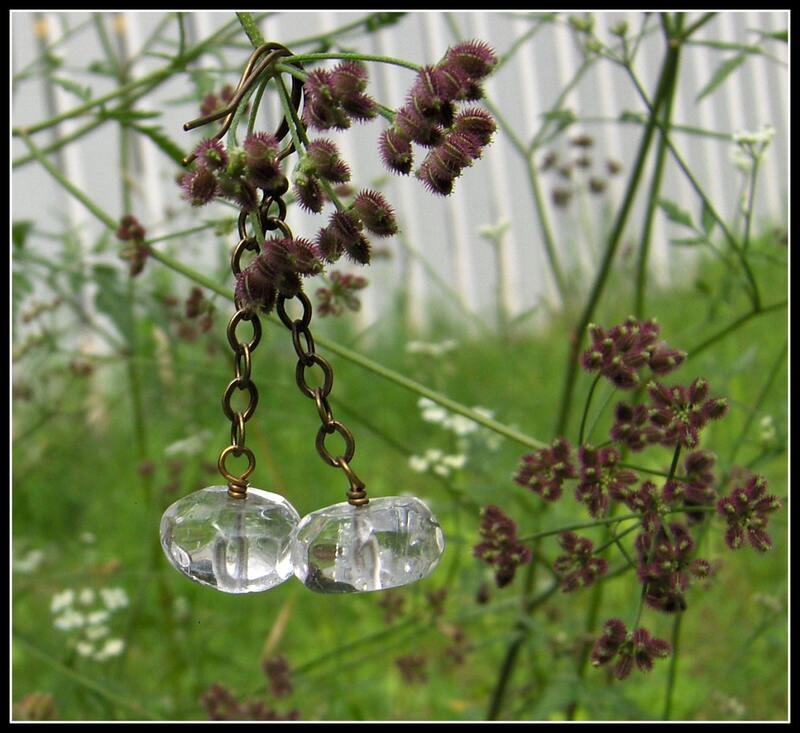 These quartz crystal earrings will go perfectly with just about anything you own. They're sparkly and full of love and light. As always, I make everything in my shop & each piece is unique. You definitely won't run into anyone wearing the same thing! These simple beauties are just less than 2" long & the crystals are 12mm. Quartz encourages clarity and improves perception and understanding. It strengthens your conviction and encourages development that is appropriate to your own inner nature. Emotionally, quartz recalls forgotten memories and brings them to conscious awareness. It helps to solve problems in simple ways and revitalizes capabilities you thought you had lost. This is stunning!! The color choices are superb and the quality and artistry is stellar. This Mala sparkles, glows, and catches the light with pure energy. Great communication! I highly recommend this shop! PHENOMENAL!! I have to say this particular mala I was drawn to right from the start. It was refreshing to find RebeccaMoonDesigns attention to detail and care for putting such stones together. It's beautiful its light and feels good. I have 2 other malas and they are heavy. Theses beats are light and have such an organic feel. I didnt know that that was what I wanted until I recieved this one. After all you get you what you need and that is perfect to me. Thank you Rebecca ,I will spread the word and be back during my next shopping season. 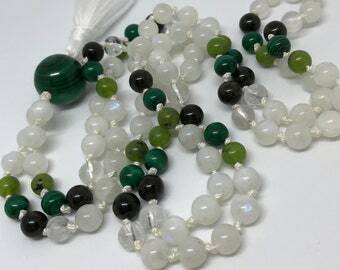 Wonderful Mala powerful in person! Appreciate the packaging and printed description of the power of the stones. Happy Birthday to Me! Highly recommend Rebecca's work; I met her in person and she's a lovely Soul sharing spirit. I accept either direct check out or PayPal payments. Please ensure payment via Paypal is completed upon checkout & that the shipping address on Paypal matches that on Etsy. I will accept returns if your purchase wasn't quite what you were expecting. I will gladly take the item back within 10 days and refund your purchase price minus the shipping fees. You will need to ship the item back to me at your expense & I suggest insuring it, as it is yours until I receive it. Please return items in their original condition and unworn. I am unable to accept returns on custom created pieces. I do offer a limited warranty on malas - if something should happen within 60 days of purchase, I'm happy to re-string your mala for no charge. After 60 days, a re-stringing fee will apply. I ship items out via USPS Priority 2-day mail within 3-4 business days of your cleared payment, and usually sooner. Shipping insurance is included in the price. Shipping overseas is via USPS first class and w/i 3-4 days, but arrival varies by country. If you paid via paypal, I always check to be sure the paypal address matches the one you provided in Etsy. If it does not, I'll convo you to ask you which address you'd like your item shipped to. You can save me a step if you leave direction in the "note to seller box" if your Etsy address differs from your paypal address. Thanks! If you're local & don't want to pay shipping, convo me to make arrangements and request coupon code for free shipping. I love custom designs, so feel free to contact me about a special piece just for you! 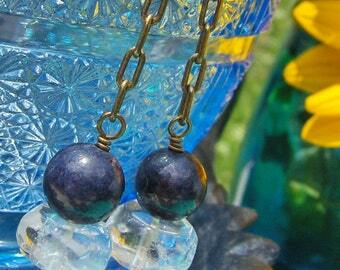 I can create something by color, stone, metaphysical properties or style. Please either send me a convo here on etsy or feel free to email me directly rebeccamoondesigns@live.com & we can work out the details. All custom work requires a non-refundable down payment to begin & the remainder (once the piece is complete) is to be paid before the item is shipped. Items in the shop can only be reserved with a 50% down payment & the sale must be completed within 30 days. All down payments (or partial payments) are non-refundable, but can be applied as shop credit.